WASHINGTON, DC, February 27, 2012 (ENS) – The Bureau of Land Management announced Friday that it has selected a location for the nation’s first wild horse ecosanctuary – a privately owned ranch in southeastern Wyoming 30 miles west of Laramie. The BLM will conduct an environmental assessment of the site under the provisions of the National Environmental Policy Act. The BLM expects its NEPA analysis to be completed in three to six months. Then the agency decide whether or not to enter into a formal partnership with the landowner. The proposed 250-horse ecosanctuary would help the BLM feed and care for “excess” wild horses that have been removed from Western public rangelands. The facility would be publicly accessible for potential ecotourism opportunities. In all, 19 parties submitted private land ecosanctuary proposals to the BLM in response to its Request for Applications posted on www.grants.gov on March 15, 2011. Proposals were turned down if they did not meet the BLM’s minimum requirements, including ownership or control of the necessary land and a proven ability to provide humane care for at least 200 wild horses. The BLM selected a proposal from Richard Wilson, owner of a 4,000-acre ranch in Wyoming’s Centennial Valley, a summer and winter recreational area. If a partnership agreement with Wilson is finalized, the BLM would sponsor the ecosanctuary at a funding level comparable to what the agency pays ranchers who take care of “excess” wild horses on long-term pastures in the Midwest. The agreement would also contain a fundraising component to help defray costs for operating the sanctuary, saving taxpayer dollars. “This selection is a milestone in our overall effort to reform the Wild Horse and Burro Program and put it on a cost-effective, sustainable track,” said BLM Director Bob Abbey. “Although the Wyoming ranch can likely handle more than 250 horses, taking a cautious approach will enable the BLM and Mr. Wilson to properly assess and resolve any issues that may arise in the early phases of this innovative partnership,” he said. “While on the surface the ‘ecosanctuaries’ that Secretary Salazar promotes appear benign, in fact they mask a real devastating blow that has and continues to be dealt to the wild horses and burros living naturally in the wild,” Downer told ENS. “Those ecotourists who come to view the ‘wild horses’ will be viewing horses who have been displaced from their legal herd areas. They will be viewing horses that have lost much of their natural freedom both as individuals and as a collective, evolving social group. 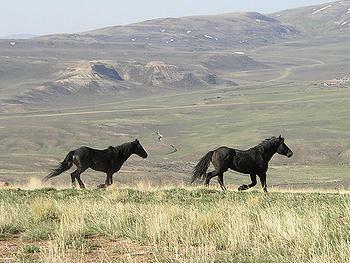 The latter was and remains the core intent of the Wild Free-Roaming Horses and Burros Act of 1971,” he said. Downer said the BLM and the U.S. Forest Service have failed to allocate and defend forage, water, land for wild horses and burros and is rounding them up and eliminating them from the Western states in favor of cattle.